When it comes to your physical fitness, exercise, diet, and rest (recovery period) are essential ingredients in becoming your physical fitness best. These three ingredients must be mixed properly in order to lose weight or gain weight or gain lean muscle mass. Some people will have a proper diet with plenty of rest but with little or no exercise. Some people will have a bad diet with plenty of rest and adequate exercise. Some people will have a proper diet with plenty of rest but too much exercise. Is that possible to have too much exercise? Is it possible to be too eager to get results and thus exercise yourself to poor health? Yes, it is very possible and highly probable especially if you always experience soreness, anxiety, excessive pain, etc. In order to maximize the results of your exercise, it is absolutely critical that you do not overly exercise. Although it is more common to have people to under exercise (rather than over exercise), it is still harmful to your overall health and fitness when you overly exert yourself for a prolonged period of time. If you are exercising at a high level of intensity for more than an hour for several days in a row, you will exhaust your body by over exercising. What could happen if you overly exercise? * You could tear muscles such as your rotator cuffs in your shoulder that will hinder any progress you make. * You could damage ligaments in your elbows and knees because they do not have enough recovery time. *You could cause harm to your nervous system because you have shocked your body for an extended period of time. * You could hurt your confidence because your strength will dwindle due to limited or no recovery for your muscles. * You could cause damages to your joints since your joints needs to be decompressed during recovery time. * Your muscles can only grow when you are resting or recovering. Thus, your muscles may even lose size. There are many other issues if you overly exercise. Recovery and rest are an important ingredient in succeeding in your physical fitness. Thus, it is important to know how to handle your intensity during your workouts. In most cases, you only need to have an intense workouts once or twice a week (at most). Also, it is important to not have a prolonged intense workout. Depending on how you do your workout intensity, thirty minutes to 1 hour is long enough in most cases. Then, the proceeding day, you can have little or no intensity during your workouts by focusing on decompressing your joints through yoga movements, ballistic stretches, and static stretches. With the way people are getting more and more intent in being more conscious about themselves and their personal physical fitness and health, memberships in the gym, yoga classes’ enrolment, and even dietary subscriptions and plans have been getting the most of their attention these days. They had been skyrocketing during these previous years. 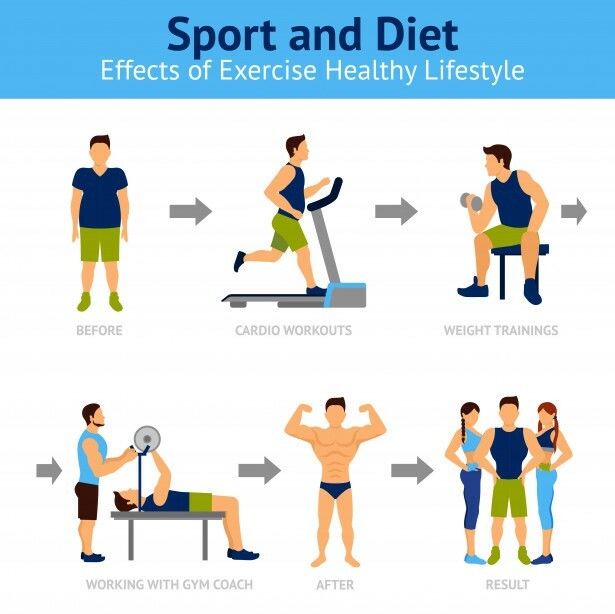 These methods and techniques are all saying that they are really helping people to become more fit, healthier, and happier, and they all introduce healthy and more active lifestyles. And since it is everyone’s goal to achieve a healthy and fit body, there are some physical fitness exercises that work best for most people. In fact there are really a lot of these that can you choose from. If you still want better suggestions, try reading to the very end of this article and find out what fitness exercise will work best and will make things easier for you, too. These can certainly help you in having an elevated heart rate over such sustainable period of time. By doing this, you will get an improved and fully functioning cardiovascular system especially when you try the correct breathing techniques. It would also be fun if you will do this within a group. Aerobic exercises will help promote toning of muscles and in keeping a healthy lungs and heart. This type will help you in extending your limbs and your muscles so that they can reach their maximum possible length. These types of exercises will also help you in loosening you up and is preferred as warm up exercises for a more complicated work out and gym sessions. This is designed to help a person toughen up and to create a taut, lean, and an overall toning of the body. This exercise will definitely require the utilization of free weights while doing the training of building up endurance and strength. It would be difficult at first; you may even feel pain and the feeling of being sore all over because of the exertion that your muscles did and since your body is actually rebuilding itself. But the next instance you go to the gym again, you will be going to be better prepared so that you can tackle and face the hard road towards your desire for overall fitness. Take note, regular exercise will definitely produce faster and more positive results that you have to be certain that you will be disciplined enough to maintain your regimen, as it relates to your routine. Don’t worry, results will surely come; you will have to put in the work to start seeing results but it always come in time. Your patience and consistency as well as all your hard work will surely pay off, don’t 2nd guess and wonder if your fitness and appearance will ever improve; it always does. However, do not over exert yourself, because this might lead to much bigger troubles. If you feel that your muscles are getting too sore from over training or if a specific routine has brought you a lot of pain that you cannot manage anymore, you can try switching to a much lighter one and start again from there. Or else, you might be doing something wrong. Keep in mind that you have to warm up before doing any rigid exercise so that you will be loosening up your muscles and minimize your chances of injury. Now go get the body and health you deserve because you’ve signed up to put in the work needed to accomplish it.